With great devices like the rugged-themed Ulefone Armor and Ulefone Armor 2 , the Chines smartphone manufacturer is taking no break in device production and putting in her all to win the heart of customers in the saturated smartphone market. 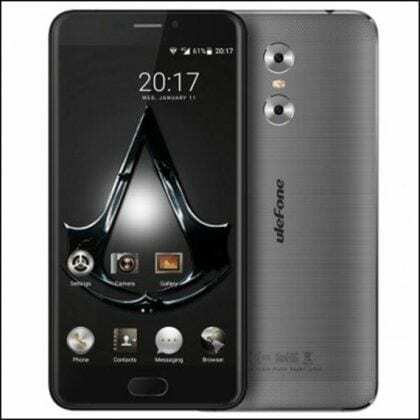 The Ulefone Gemini is an affordable budget smartphone that equally has top build and quality; one that many expensive high-end devices lack. It is in this sense that we shall be looking at the specifications, features and price of this device under this review. On first glance at the Ulefone Gemini, one would appreciate the work Ulefone put in to produce such a nice device with wonderful aesthetics. The shiny and smooth metallic body surface of the Ulefone Gemini also adds to the device’s attractiveness. At 185grams, the device is also quite lightweight when compared to other budget smartphones out there in the smartphone market. As a matter of fact, the battery is what adds to the weight of the device. The camera set-up at the rear is also one of a kind. The dual camera at the back of the smartphone are of the same size and diameter and are equally separated by the LED flashlight. The minimalistic view of the device’s frontal is also a catch point. The front simply houses the secondary (selfie) camera, earpiece, proximity sensor and fingerprint scanner which sits below the display screen. The screen is a 5.5-inch Full HD display. The display possesses a resolution of 1080 x 1920 pixels and its pixel density is tagged at 401 pixels per inch (ppi). 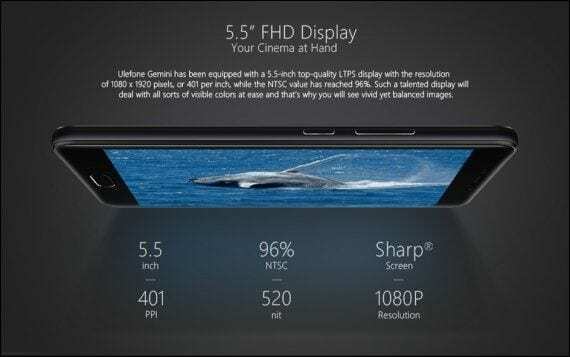 The screen used on the Ulefone Gemini was manufactured and supplied by SHARP®; a renowned company that produces high quality display screens. 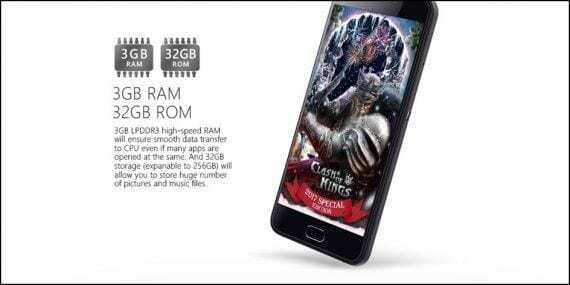 The Ulefone Gemini has MediaTek MT6737T Soc that powers it and further supported by the large 3GB RAM to ease processes and aid smooth multitasking. The Ulefone Gemini is definitely not the kind of device to experience lagging or heating up during usage. The Gemini smartphone comes out of the box with the old Android v6.0 Marshmallow operating system but can be upgraded to latest Android v7.0 Nougat operating system via over-the-air (OTA) update. The 32GB ROM also gives enough storage space to keep documents. And just in case you mange to run out of space, the storage can be expanded to up to 256GB using external micro SD card. The rear camera is a dual camera set-up which comprises of a major 13MP sensor for capturing moments and a 8MP sub-camera whose function is to provide accurate focus on the subject to be captured. The LED flash in the middle of both cameras brightens up images to be captured both under low and high light conditions. 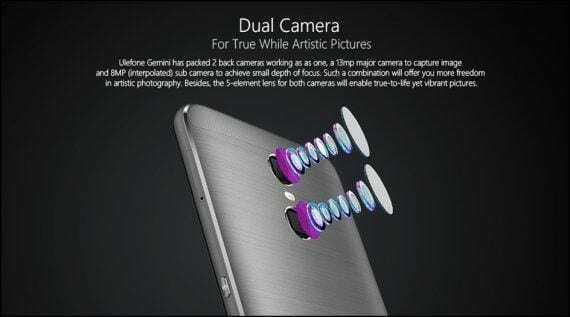 The secondary camera is a 5MP camera which also takes high quality selfies and perfect for video calls. 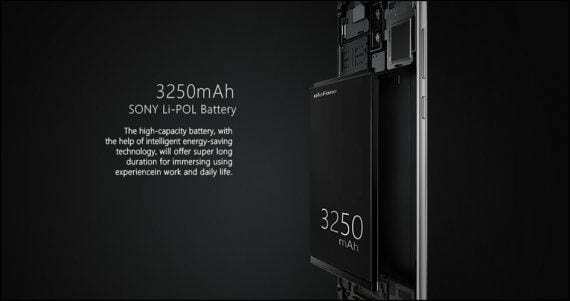 This budget smartphone is powered by a non-removable 3,250mAh Li-Polymer battery manufactured by SONY. The Ulefone Gemini lacks Quick charge technology which would take the battery longer period to charge. However, the presence of the intelligent energy-saving technology on the device, the battery relatively lasts for a long period of time. The Ulefone Gemini costs between $120 and $140.